We would like to thank Nyasha for Choosing ICL Boulby to undertake her works experience in our Laboratories! Nyasha recently left school in June after successfully completing her GCSE’s and wanted to gain experience in a fully working laboratory surrounding. Abigail Sinclair, one of our Laboratory Analysts demonstrated to Nyasha how to operate the many laboratory machines used in her day to day work. 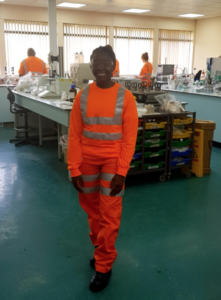 Abigail explained their importance to the company and gave Nyasha the chance to join in with the low risk analysis of materials, working alongside the team to give her a good understanding the work also ensuring that she understood the safety aspect of the department. “The team thoroughly enjoyed having her here” said Abigail, and went on to say “Nyasha has learned lots of new skills and approached every task with enthusiasm”. “During her time with us, Nyasha has developed a number of different skills including working with Microsoft programmes, such as Excel and Word”. Using the things she has learnt with Abigail, Nyasha will join The English Martyrs School and Sixth Form College with a basic understanding of what to expect when she has qualified. Nyasha would be able to achieve her A Level qualifications in Chemistry and Biology allowing her then to pursue her ambition of becoming a Doctorate in Surgery. ICL Boulby wish Nyasha all the best for the future and good luck with her A Levels.